my blog and hubby is deep in some Japanese number puzzle that is something other than a sudoku! Ah, companionable independence is much underrated in modern relationship parlance! I am being a tad unfair here; romance was very much in evidence as we spent Valentines morning walking along a very blustery Port Eynon Bay and then running back to the apartment over the sand dunes. We topped that off with a lengthy lunch at King Arthur Hotel in Reynoldston where we enjoyed good food, good company and a log fire. If any of you have yet to discover the Gower peninsula, then I heartily recommend it…and in February, you get all the beaches to yourself! And speaking of reading…a damp February break in Wales has given me ample opportunity to sink down into the leather sofa cushions which we have artfully positioned on the floor so that we both get a good sea view, and read for more hours than normal life allows. I will begin with Eleanor Oliphant is Completely Fine by Gail Honeyman. This formed part of the delicious package of Costa winners that plopped through my door just in time for half term. Gail Honeyman won best debut title. The writing style of this novel is light and well-constructed. Told in the first-person, I immediately liked the central character’s self-deprecating tone. The premise is simple. Eleanor Oliphant lives a perfectly acceptable life. It is however, predictable, safe and routine. She is existing rather than living. Why she lives like this and whether she has the courage to change it forms the crux of the fiction. Early in the book, we learn that she has scarring to her face that she suffered following a fire. This piques curiosity about the circumstances behind this. My interest was heightened by the use of names that readers of classical texts will quickly recognise as being from Jane Eyre. Thus in the first social work report we see that the Deputy Head Of Children and Families in the Social Work Department is a certain Robert Brocklehurst, Mr and Mrs Reed are the foster parents and their children are, yes you’ve guessed it, John, Eliza and Georgie. This continues when we meet Maria Temple a counsellor, later on in the book. Now I may have missed a trick here, but a face scarred by burning and unsubtle use of nomenclature led me to want to make a connection with Charlotte Bronte’s work. But it didn’t happen. The allusions were merely that, just allusions. A tenuous link to a madwoman in the attic can be drawn, (but no spoilers) but still the references added nothing to either text. Perhaps such literary self-consciousness masks a fear of inferiority from this new writer, but as the Costa accolade and clamouring for film rights have proved, that is not necessary. This is a good novel. Gail Honeyman is a completely fine writer, if you’ll forgive my blatant allusion to her own title. The story is entertaining and Eleanor is executed with just enough empathy that you care about the outcome. The book conveys what it is like to be lonely in the modern world. This is an important topic and one which needs to be aired in fiction. There are a lot of Eleanors out there in some guise or other who appear to be completely fine, but are not. I wouldn’t agree with one critic who said the book was “powerful;” I found it a good read, one that I thoroughly enjoyed but possibly not one I will re-read. Stories where loneliness and isolation form a central part of the protagonist’s identity have featured in my other reads for this month. One was Andrea Levy’s Never Far from Nowhere. The title speaks for itself, and is a direct quotation from Olive, one of the focalised voices. Told from the perspective of two sisters, born of Jamaican parents and living in Islington in London, Olive states that folk like them, no matter how far they feel they have been accepted are never far from nowhere. Never far from rejection, never far from realisation that they never quite fit. The story centres around finding identity and belonging. Like all teenagers regardless of race, colour, ethnicity or religion, Vivien and Olive feel their way to independence. The paths the sisters take are very different and both veer between bleak despair and hope. This is a story that encompasses racism and class divide. It shows how education can be a tool to inspire, or, if misrepresented, another reason to rebel. In our multicultural, multinational, international world, we must learn to accept each other on the basis of our shared humanity. That alone should be enough to ensure compassion and equal access to education, welfare, health and employment. It is time we all believed that our humanity across all nations is more unifying than our flags, our colour, our heritage. No-one should summarise their lives as being so close to the lonely abyss that they are never from nowhere. 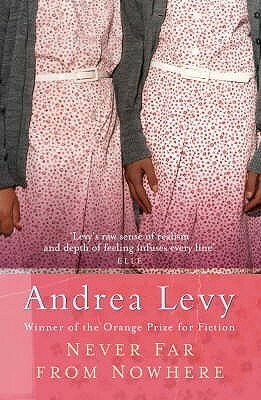 Andrea Levy is a powerful writer whose words challenge her readers and make us address stereotypes and unconscious prejudice. My next blog post will be looking at a novel by John Updike. I’d not read any of his work before, and now I want to read it all! I'll leave you with a few photos of our walking, reading and relaxing time on Gower.